When thinking about network diagrams, most people think of diagrams that depict telecommunications networks. However, a project network diagram works more like a flow chart. Rather than describing a physical network of devices, firewalls, and servers, it depicts how each task in a project connects including which tasks are dependent on one another and which can be completed in tandem. So why do you need this project management diagram, and how’s it going to help your team? There are three major benefits to using this type of diagram. 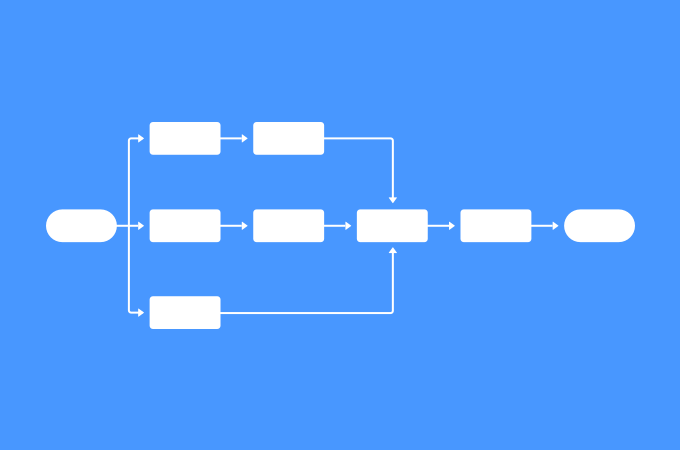 Since your project network diagram shows how activities are connected from beginning to end, your time estimates can account for not just the work being done, but the order it has to be done in. This means more accurate and efficient timelines. Plus, if anyone on your team has questions about your timeline, it will be easy to justify the logic you used to produce the estimate in the first place. Let’s say your dev team decides to tackle a difficult tech issue with a new strategy or your stakeholders decide they want to go in a different direction with a particular feature. With your project network diagram in hand, you’ll know exactly which tasks must go in a particular order and which can be completed simultaneously. By understanding this web of tasks from the start, you can implement new workflows and reroute work without affecting future tasks. In essence, you can make more thoughtful adjustments that won’t derail your project down the line. A project network diagram gives you the insights you need to be proactive. Did you notice that certain tasks took longer or shorter than expected? Did you discover dependencies that weren’t immediately clear from the get-go? Use your project network diagram as a learning tool for perfecting your project management process. Track team performance against your diagram to see where your diagram and/or team are performing unexpectedly and look for solutions. Regardless your project, you’ll need a quality diagramming tool to create a clean and useful project network diagram. You’ll also need help from your team to understand the ins and outs of every task they have ahead of them. Project network diagrams can’t be created in a vacuum. Like all good work, you’ll need to collaborate with your team to make them successful.